At the present time this November is rather dry and warm with the expected frosts clearly not going to arrive until next month or even after Christmas. This means the colonies will continue to fly collecting water and carrying out essential cleansing flights once the sun’s rays hit the hives and temperatures rise. 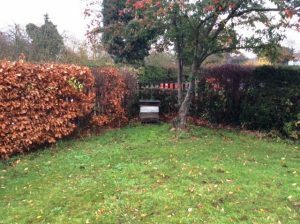 Those of you fortunate enough to have sight of a hive entrance from the comfort of your warm house might be surprised at the low temperatures worker bees will be flying as they prepare for the ‘big freeze’ once winter really sets in. 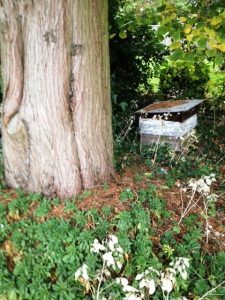 As you can see from the photographs, at the Association Apiary, large trees near to hives are not a good idea especially as storm force winds will, and can bring down quite large boughs. 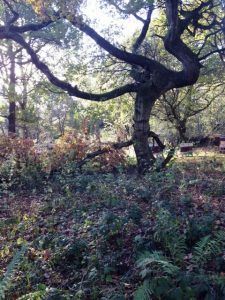 We were fortunate on this occasion that no damage was done to any of our colonies and the Woodland Team will soon have debris removed and the rest of the oak tree trimmed to prevent any issues in the future. This month is time to get your mouse guards on, the little devils will soon move in once activity in the hive reverts to a cluster. What you use, either wooden blocks or metal strips, is up to you but the best advice is to take some precautionary methods or on your head be it! When hefting the hives to check they have enough food, if it doubt put on a good lump of Fondant. It is far too late for syrup or other liquid feeds, it would just go mouldy which is the last thing you want to introduce to an over wintering colony. Other than that leave well alone, ensuring they are waterproof and they have good air circulation to prevent a build up of condensation in the hive, we should be all set for the winter. 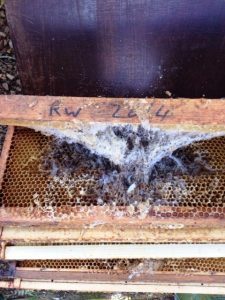 Those of you who use Varroa (mesh) floors, that is the majority of us these days, can leave the floor slide in if you wish and you can check which side of the hive the cluster is and what debris is falling from the cluster as they consume stores. But sweep it off so the debris does not build up preventing the slide coming out and becoming a good breeding place for all sorts of nasty things under the warmth of the cluster. 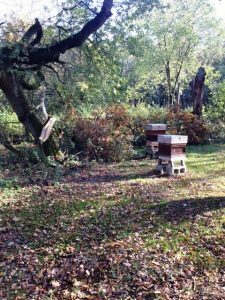 It is also a good time to put insulation in the top of the hive (if you wish) either in the form of material or manmade roof insulation which you might just have acquired whilst ‘skip dipping’ after speaking to the local builders. Any Poly Nucs you are using to over winter small colonies with young Queens will be plenty warm enough as it is a much better insulation material than most of my older wooden hives. But ensure they are strapped to their stand or as I do build a stand they fit into so they cannot be blown over. Just ensure they have plenty of Fondant above the cluster as they keep active longer in their nicely insulated home. All I do is drill four holes in one side of the top feeder( cordless drill big woodwork drill bit) and keep it topped up as the months fly by. As we have had such a warm Summer and Autumn, the wax moth has had a field day breeding well into the later months of the year as I found to my cost when putting supers away for storage. Good job I have an efficient log burning stove and an old Burco boiler for trying to reclaim frames. Well, keep an eye out for those Beekeeping Equipment bargains ready for Xmas presents or just stocking up for next year. My Bee Shed has plenty of woodworking casualties to repair to keep me going over the winter…. The Web site does bring us some interesting challenges at times and we were recently contacted by the owners of a house they had purchased 18 months earlier who are in the middle of major renovations. The garden which looks a bit jungle-like and backs onto the river Avon, was totally overgrown with enormous trees needing to be felled . But close to one of the biggest trees was an old WBC Beehive, inherited with the original house purchase. The previous owner, an elderly lady, had moved into a Nursing home some time ago abandoning this hive in the garden. 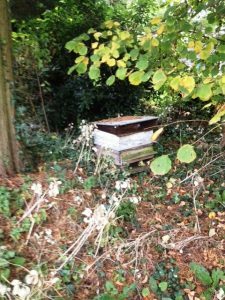 Anyway they requested we move it so they could cut down the nearby tree as the Contractor would only start work if the hive was moved! Yep, you’ve got it – a very active hive of very black bees on one and a half Brood Boxes which when Chris and I went to move (after cutting it out of the foliage including Ivy) was nearly too heavy to lift. We managed to do so and at present it is in my front garden, in a nice sunny spot, ready to move back once the tree felled garden is cleared and a new site prepared. 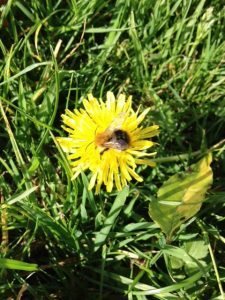 The new owners intend to try and keep bees in the future, buy a new hive and attend our Beginners Course – Brilliant! WBC awaiting its’ return home. The transfer of bees from the old to the new hives will be quite a task as years of wax and propolis has ‘fixed’ (I’m being polite) everything together but the bees are clearly survivors. 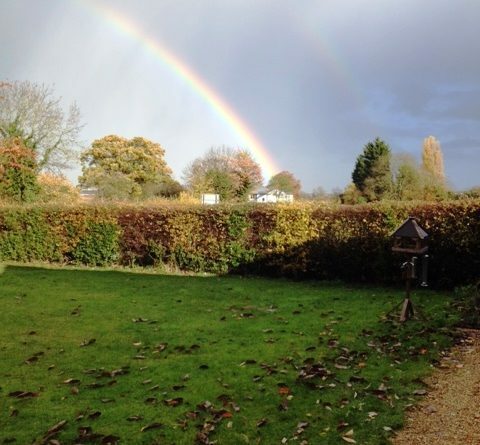 Next Month – Woodpecker protection and preparation for those inevitable wet winter storms.